The places in between are where design makes its greatest difference. Expectations of inclusivity will tip the balance toward community and transparency. The boundary between the public realm and private or exclusive may be more porous and nuanced, especially when public-serving open space or cultural elements are involved. The places in between can easily slip off public and private maps. If settings like this are intrinsic to the everyday, their stewards will want to be more visible. Upkeep and safety are givens, but these places will attract patrons and impresarios of the experience. The desire for urbanity will favor a richer, denser, and less expected mix of people and activities. The embrace of a startup, freelance, maker, artisanal, farm-to-market economy will give rise to hybrid settings, used intensively, that change from day to night. Part of people’s desire to shape experience is the expectation that it will be accessible to them. It means that experience will be designed to compensate for differences in sensory perception. It will enable people to navigate the unfamiliar. An integrated and collaborative mindset is essential to STEM education. That mindset is quickly catching on for other models too. A cross education, there is a push to speed up learning and spark creativity. It is leading schools to reevaluate how students learn best, and how to teach them the skills they will really need. The result is a heightened interest in active, experiential learning that reflects the world students will graduate into—one fueled by innovation. Students today have grown up with unprecedented access to information. They have the tools to forge their own learning paths, and a belief in doing so. To provide students the personalized and hands-on approach they expect, schools are leveraging technology and maker culture, and restructuring their curricula. In the process, education itself is being reinvented. But not all at once; for this shift to happen, space really matters. It is an active part of these evolving pedagogies. The most successful spaces empower students to solve things that matter to them in their larger social context. This kind of problem-solving often requires more collaboration and a diversity of learning styles. 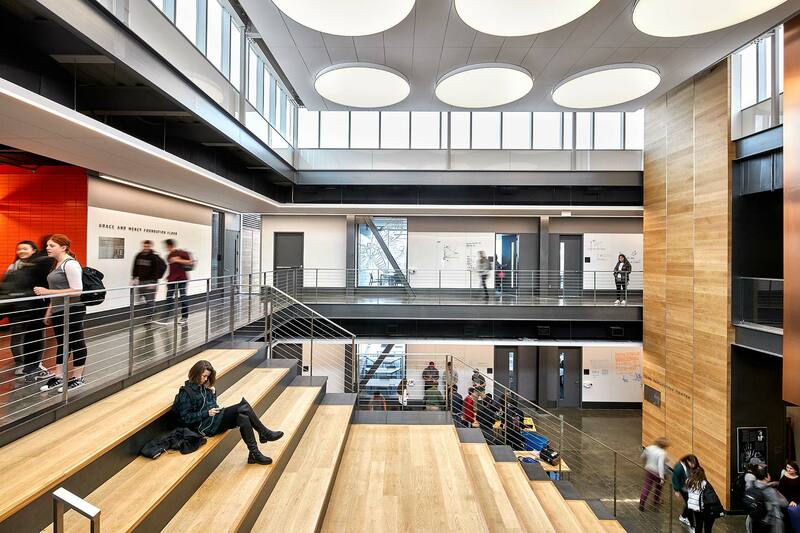 Educational institutions are asking for spaces flexible enough to accommodate these new modes. The classrooms at Dwight-Englewood’s new Hajjar STEM Center are spacious, with movable furniture and writable walls; they more resemble labs and studios—where students can move around and work differently depending on the assignment—than traditional classrooms. Students are also encouraged to make use of the shared spaces outside of the classroom for more hands-on activities. This visibility and interactivity prompt students to look at things from multiple perspectives and to integrate those perspectives in their thinking process. 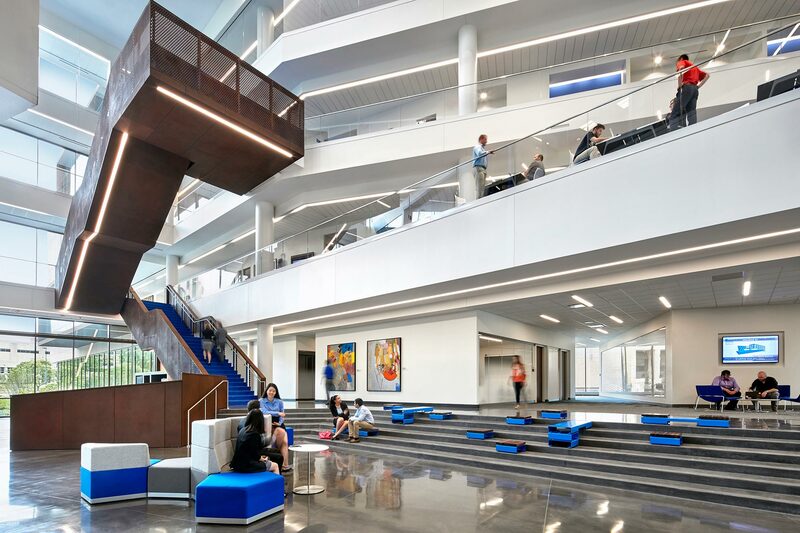 Gensler research on both education and workplace shows that more collaboration and the use of different spaces for different work modes correlate to higher levels of creativity and innovation. Transparency plays a big role in creating these settings. 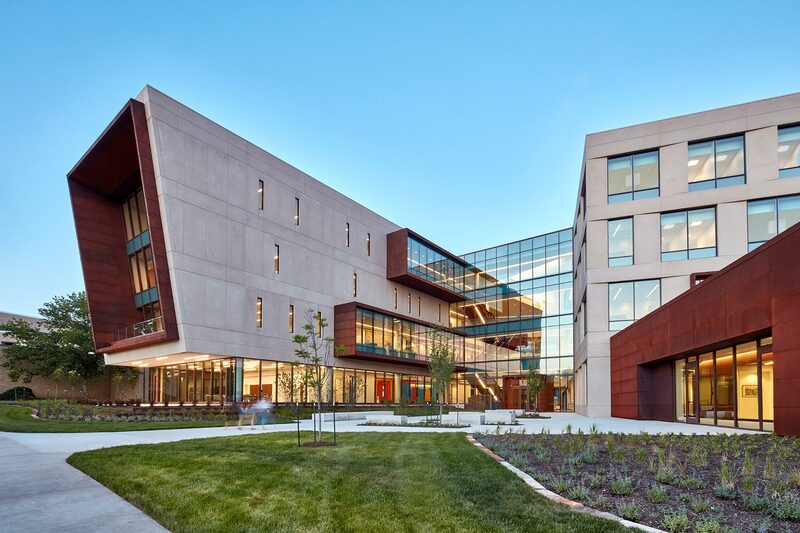 At the University of Kansas School of Business, it serves to spark connections and inspire a more entrepreneurial culture for the whole campus. And at Duke Kunshan’s sustainable campus, learning happens everywhere and with everyone, to support a diversity of learning styles and innovative learning strategies. Transparency also communicates the larger context of education today—the partnerships with business, government, and communities that educational institutions are forming. These relationships make education relevant, while elevating the roles of learning, creativity, and curiosity in other sectors of society. This new context of education positions universities as anchors of growth for their communities. TAILORED: Schools are reevaluating how students learn best, and how to teach them the skills they really need. FLEXIBLE: Schools need flexibility to allow collaboration and support a diversity of learning styles. CREATIVE: Schools want students to become creative thinkers. How do their settings activate that in them? As our health becomes more personal and measureable, it spreads into our daily lives and spaces, and the medical industry becomes an integrated network to provide care. Patient-centric care, collaborative administration space, and education in one transformative facility. Healthcare today is an expanding field, as broader concerns of health and well-being extend into our daily lives. It is increasingly personal—think DNA sequencing and the health monitor in your pocket. It’s also more public—one of infrastructure and access. As digital tools enable us to track our own health and that of our environments, big data reveals the connection between them, giving rise to an integrated model of health. In order to deliver the best care effectively and efficiently, healthcare systems are looking to address the root causes of health and disease. Because that typically points back to a patient’s life beyond the hospital walls, more providers are positioning themselves as hubs of care for their communities, providing not only critical services, but outreach too—a wide range of services, to promote well-being inside and outside of their facilities. The Cook County Health and Hospital System has a long legacy of providing community-based care to the underserved. The new Central Campus Health Center expands that mission. The new facility—combining clinical, administration, and educational spaces—is designed to elevate the well-being of patients and of the community. It visibly communicates the future of accessible, state-of-the-art healthcare, prioritizing outpatient “health” care and reducing the need for costly inpatient “sick” care. The nature of care and its settings are changing to achieve farther-reaching solutions. In favor of the collaboration and interdisciplinary partnership that speed innovation and reduce cost, the healthcare industry as a whole is forming an integrated network focused on holistic outcomes for individuals and whole populations. The new China R&D Center of MSD (or Merck in the US and Canada) shows the global, research-driven face of the industry. JLABS @ TMC, Johnson & Johnson’s incubator program, supports healthcare startups in their research and discovery. The innovative lab is located at TMCx, providing its members with sophisticated technology and the opportunity to work with other researchers and companies to advance healthcare together. HUMAN-CENTERED: Healthcare is increasingly personal—think DNA sequencing—and accessible—enabling digital as well as physical access. COMMUNAL: To keep people healthy, more providers are positioning themselves as hubs of care for their communities, providing a wide range of services, to promote well-being inside and outside of their facilities. Work’s new landscape is transforming to deliver the innovation that fast-changing markets require. Flexibility and agility are built in. This petroleum consulting firm added amenities, new technology, and daylight to energize its space. The new workplace is a moving target—as organizations flatten, collaboration increases, and technology frees workers from their desks. To keep pace, companies are reinventing the workplace to adapt to these changes and deliver innovation. 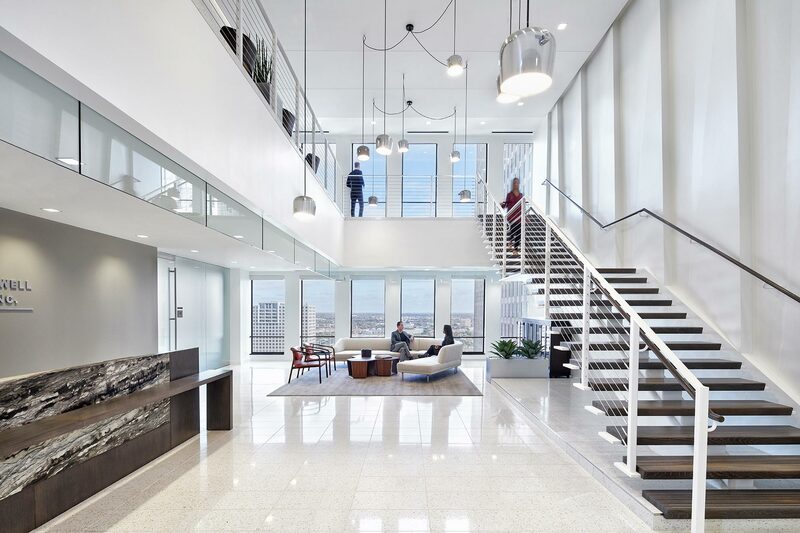 In San Francisco, the law firm Coblentz Patch Duffy & Bass LLP approached Gensler to help with their move from the Ferry Building to the Financial District. In the process, they reduced their real estate footprint by nearly one-third. The downsizing prompted the firm to dissect their ways of working and prioritize needs. They opted for a single-size-office strategy that reflects their democratic culture, and added welcoming social spaces. Corner locations house informal meeting areas rather than partner offices. 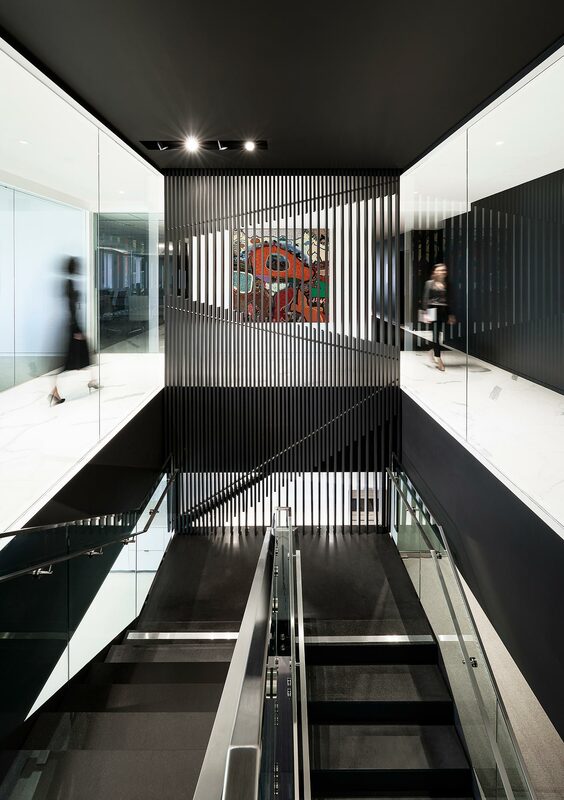 And a dramatic interconnecting stair provides places for collaboration and impromptu conversations. 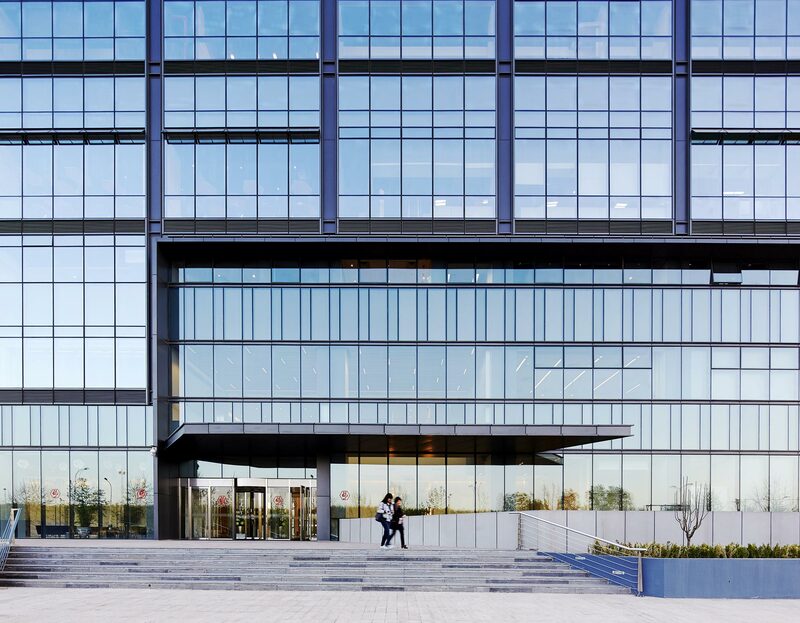 In San Jose, California, the three-tower, 1 million-square-foot campus of Adobe was reimagined to empower creativity, encourage community, and inspire innovation. The West Tower, for example, was reconfigured from 100 percent enclosed offices into an open floor plan. Now it features a variety of communal areas and alternative workspaces that draw people together and inspire creative thinking. To encourage staff to interact, the 14th-floor breakroom was relocated from the heart of the building to the end, where it captures pedestrian flow from the other towers and receives more daylight. A large communal table, kitchen island bar, and collaboration spaces on each end of the breakroom offer alternative workplaces. Amenity spaces include three cafés and a fitness center tailored to yoga, meditation, relaxation, and exercise. Today the optimal workplace is a platform for creativity and performance. 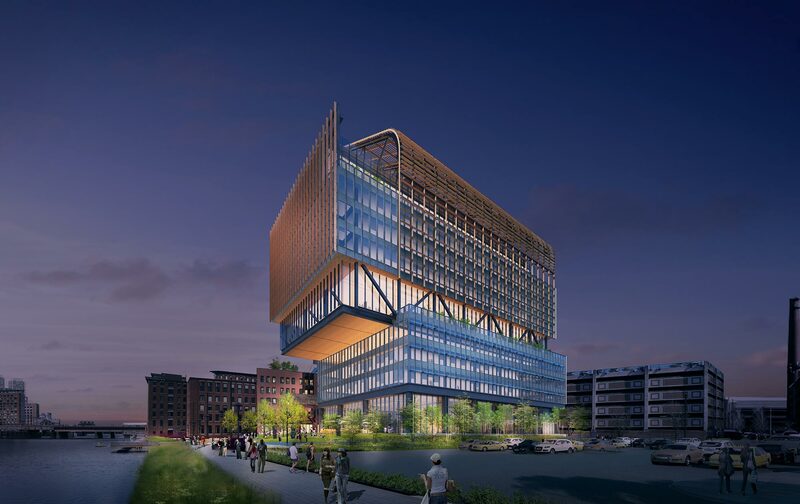 In Boston, a new waterfront headquarters for General Electric embodies GE’s transformation into a digital industrial company—one that creates an open, collaborative, and sustainable experience. 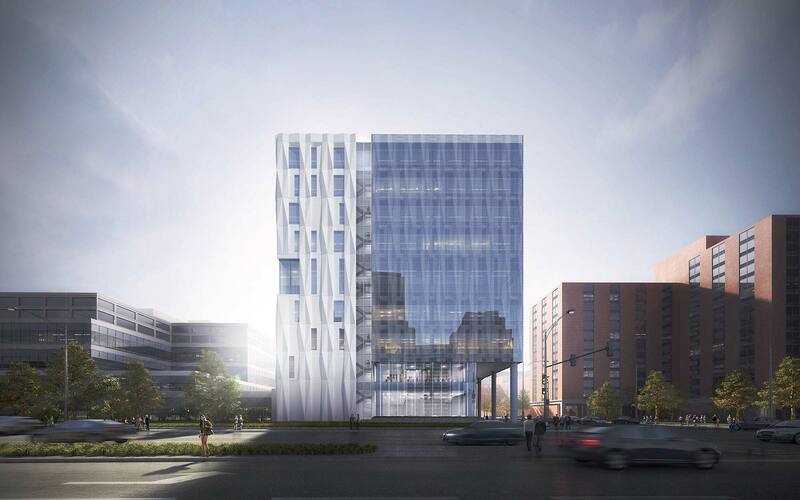 The design highlights the connection between GE's rich history and a forward-looking view through the renovation of two historic factories and construction of a new 12-story building. The combination will drive a diversity of experiences and cross-fertilization of ideas, which accelerate innovation. The innovative workplace is a platform for creativity and performance, with features like flexibility, choice, transparency, and connectivity. An important feature of the campus is its extensive indoor and outdoor public space. GE looks to engage the Boston ecosystem in idea generation, creating solutions that will have impact worldwide. The new building is set back from the waterfront, allowing the landscape to flow through public spaces. The indoor public areas will include a maker space, a bistro, and an experience center. The community lounge will function both as a reception area and coworking café space for public use. The office of the future even comes in the guise of tradition, as it does at 25 Kent, a new commercial office building in Brooklyn’s Williamsburg neighborhood. 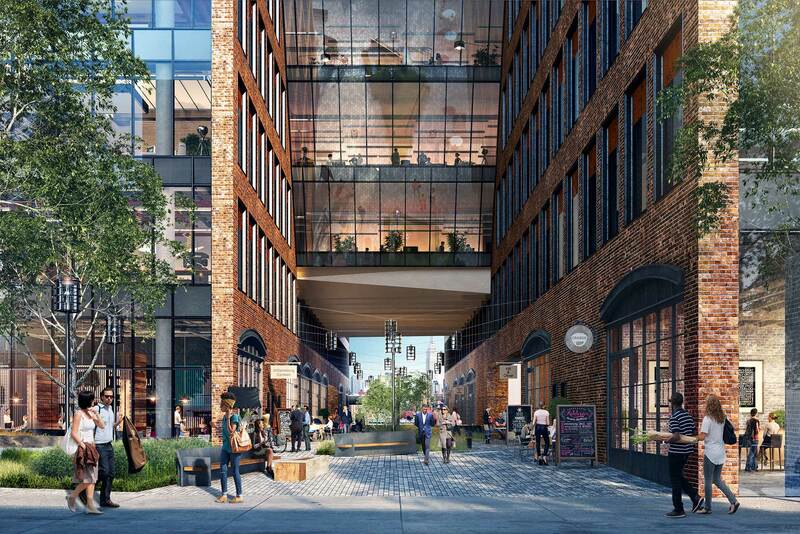 Designed to reflect the area’s industrial past, the mixed-use complex is forward-looking in the way it addresses workspace design for growing technology companies. With floor plates that vary from 40,000 to 60,000 square feet, the building has a modular layout that adapts easily to tech’s changing needs. Additional space is dedicated to light manufacturing to accommodate the maker community. Ground-floor frontage along the perimeter and internal streets will add the vitality of retail, artisanal food and drink, and local goods and services. Creative outcomes are encouraged by blending hospitality influences with open workspaces. What defines the innovative workplace? It all comes down to how it supports the individual, the team, and the community. MOBILE: The transformation reflects organizations flattening, collaboration increasing, and technology freeing workers from their desks. CULTURE: The optimal workplace gives people flexibility, choice, transparency, and connectivity. ALIGNMENT: Innovation happens when the workplace supports the individual, the team, and the community. 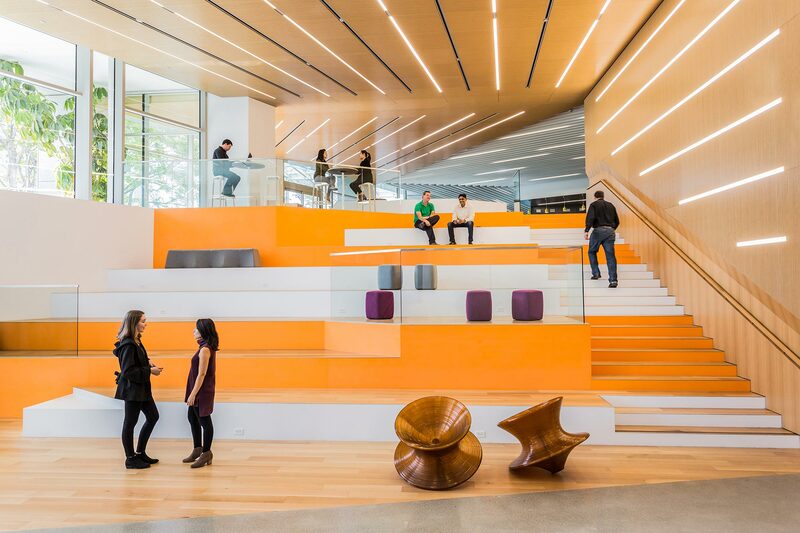 Great workplace design drives innovation. A great workplace experience improves employee performance as well. Based on our research, we know that means designing to support not only the collaboration that spurs creativity and innovation, but also the focused individual work that is important to effective workplaces. In 2016, Gensler completed the most recent installment in our 10-year Workplace Survey research effort—a global initiative that spanned the US, UK, Asia, and Latin America. Based on the responses of more than 11,200 office workers, the four surveys represent a wide range of geographies, industries, ages, and job roles. In our US Workplace Survey alone, we gathered data from more than 4,000 randomly sampled office workers in 11 industries to understand where and how work is happening today—and the role design plays in employee performance and innovation. Our 2016 US data uncovered a statistical link between the quality and functional makeup of the workplace and the level of innovation employees attribute to their companies. By comparing employees with the highest innovation scores to those in the lowest category, we arrived at the conclusions shown to the right. Have better designed workspaces of all types. Spend less time at their desks. Have more choice in when and where to work. Have greater access to amenities. Report more meaning and purpose in their work. in more functional workplaces and effectively manage those functions. beyond the desk by including a variety of group workspaces. the organization by giving people choices about when and where to work. employees with the mission, purposes, and meanings behind their work. Innovative companies are five times more likely to have workplaces that prioritize both individual and group workspaces.